Use a 9×13 cake pan. Mix crust ingredients together, pat down on bottom of pan with spoon. Place in freezer to harden for 20 minutes. With a mixer and large bowl blend together well the creamcheese and Caramel Apple Dip Mix. Fold in crushed pineapple, the 1/2 of the CoolWhip®. Spread over the crust layer carefully. Place in refrigerator for 20 minutes to set. Using a medium size bowl, mix the instant pudding according to the directions using only 1-1/2 cups of milk. Gently fold in remaining CoolWhip® and mix well. Spread over the caramel layer and garnish with reserved crumb mixture. Return to refrigerator to set for 1 hour. After serving keep the remaining dessert refrigerated. Makes 10 servings. Amen! 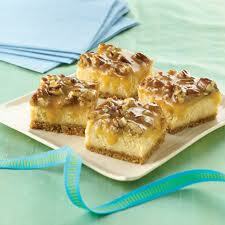 We like the combo of the pineapple/caramel…it’s just different!